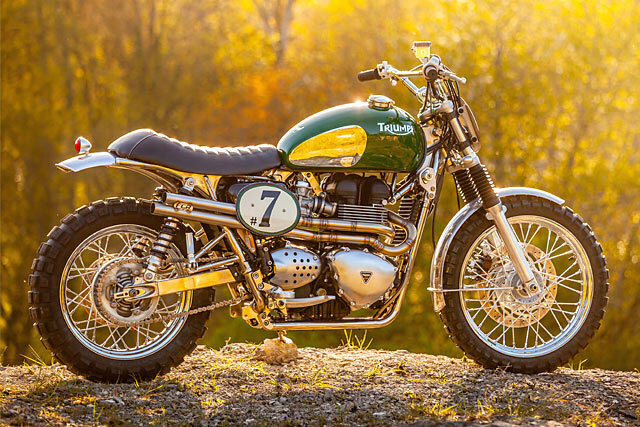 For all their marketing bucks, there’s one thing the motorcycle manufacturers’ money will never be able to buy. 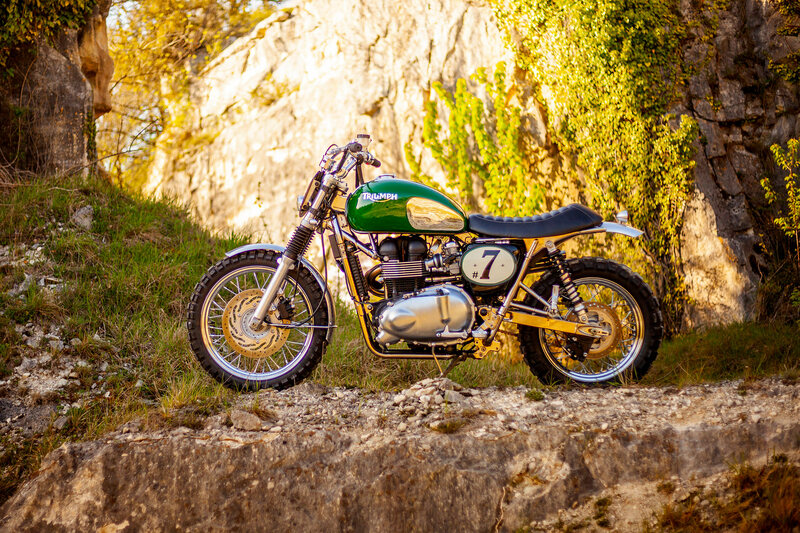 It’s the same stuff that Burt Monroe, Giacomo Agostini and Rollie Free have in spades; authenticity. Often created by random acts of insanity and then distilled by history, it’s a licence to print money for brands when their planets align and they find themselves part of it. 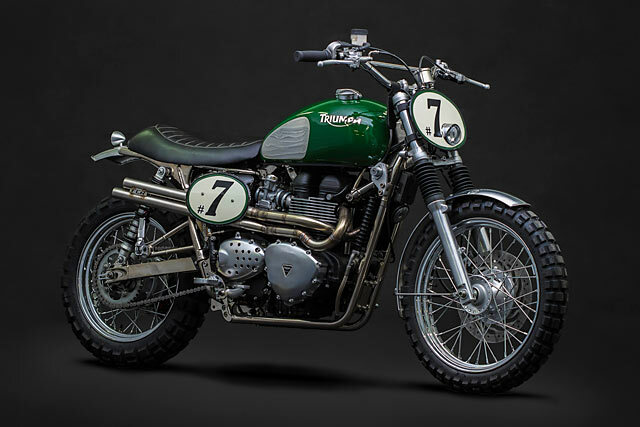 For Triumph, those planets mostly revolve around Steve McQueen’s star. 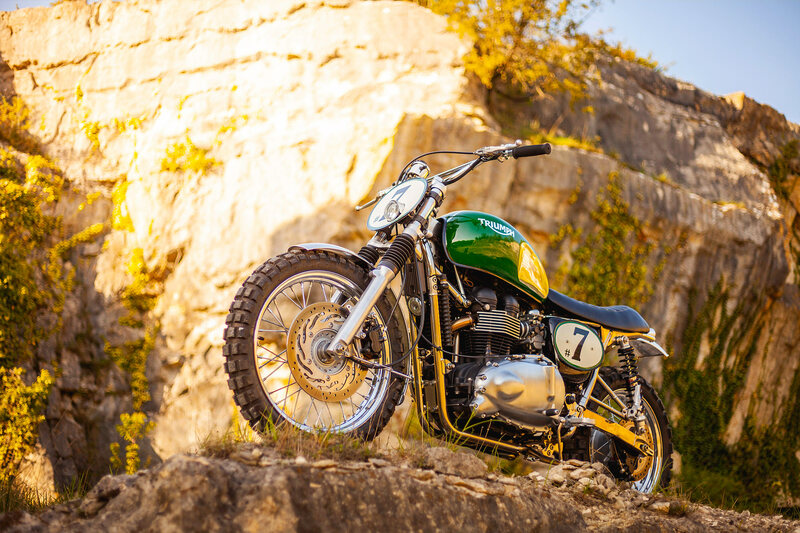 His bike building activities with Bud Elkins in the early ‘60s to create Triumph off-road racers are now the stuff of legend. Here’s Frenchmen FCR Original with their ‘Green Legend’, an homage that makes us want to watch On Any Sunday for a 42nd time. When the name Steve McQueen is mentioned, most ‘normal’ people will think of movies like The Thomas Crown Affair or Bullit. But not us. 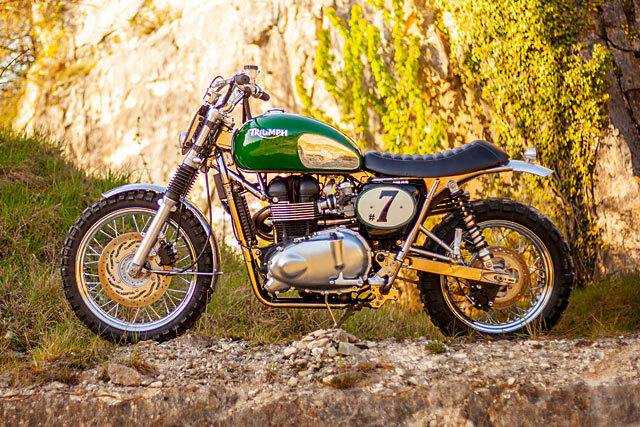 We all think of British Racing Green Triumphs and the fence jumping scene from The Great Escape. 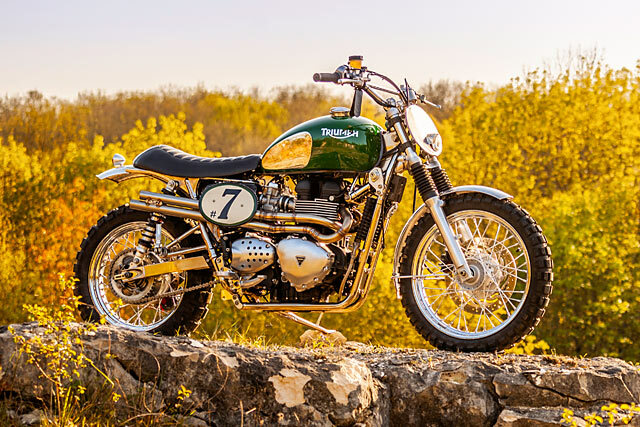 So when the FCR team decided to use a Triumph Bonneville for their latest design and manufacturing efforts, it’s probably fair to say that they didn’t exactly go into the exercise with a blank piece of paper. 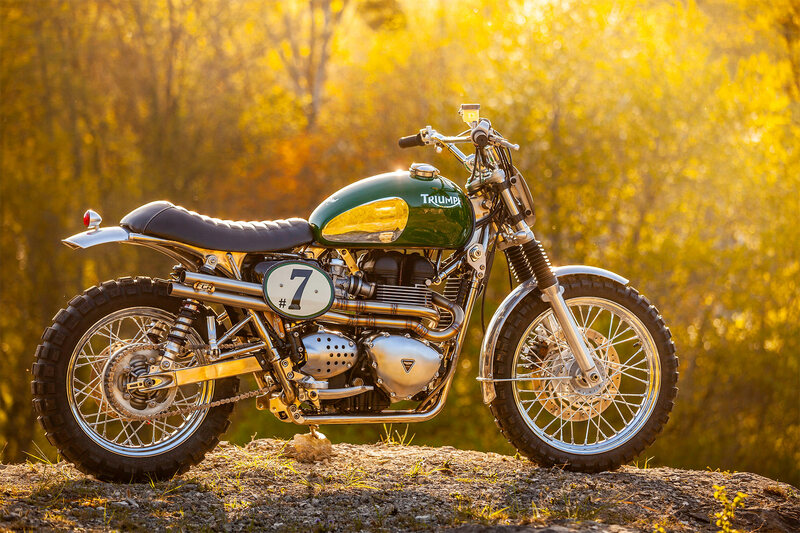 In fact, its purpose was clear – it was to be a tribute to the now mythical McQueen Triumph enduro and scrambler bikes from the ‘60s. But to do the legend justice, a mere cosmetic makeover or a bunch of superficial changes just wouldn’t do. 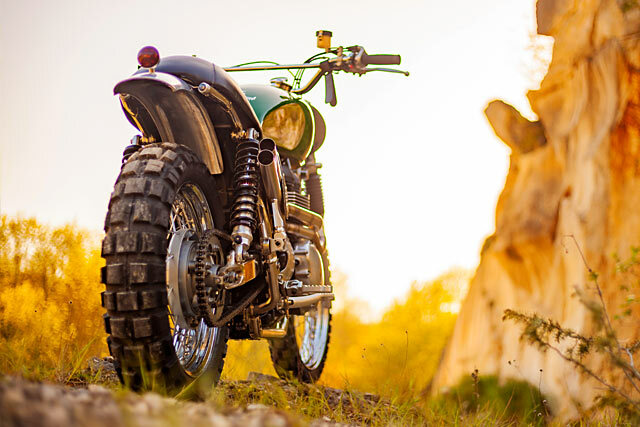 Yes, the bike’s aesthetics are very important – but so is its mechanicals. 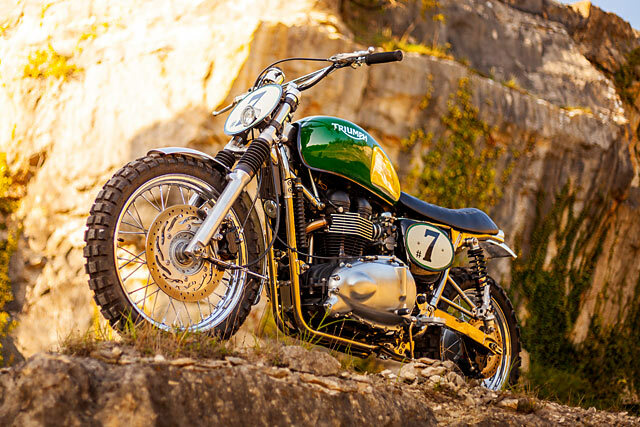 And that’s because they wanted a bike that McQueen would be happy to ride. 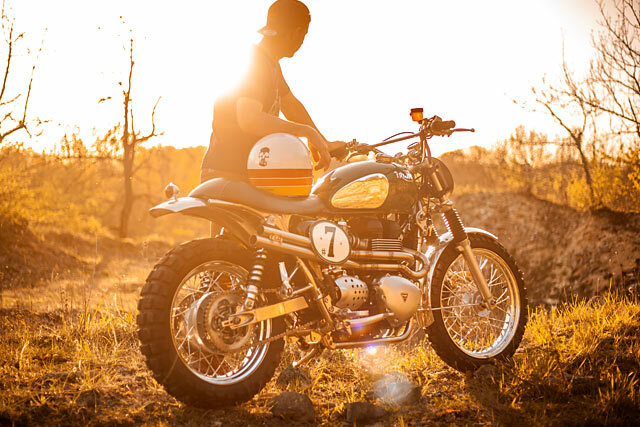 Like the man himself, the bike isn’t the type to yell ‘cut’ when the action starts and call in a better prepared stunt double to do all the fun stuff. No siree. 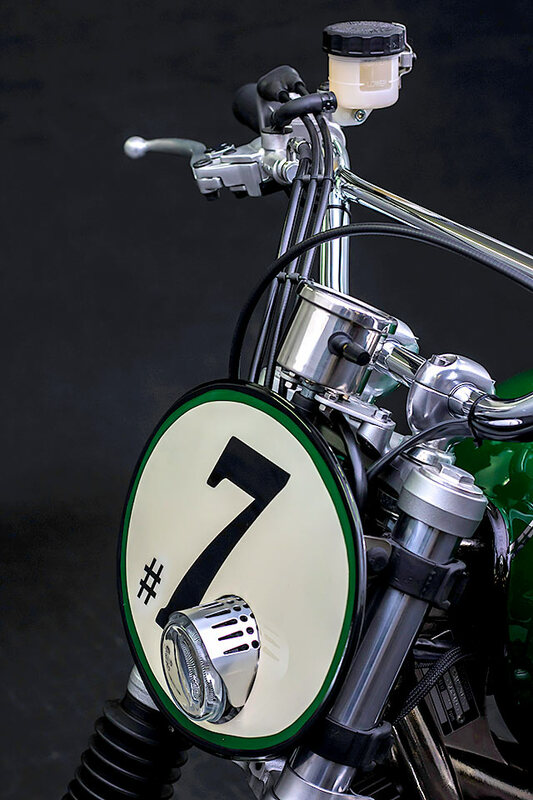 Once the bike was made as light as possible via the angle grinder and the torch, details such as the frame and swing arm were stripped at the abrasive plant and nickel-plated to give an authentic – and damn spectacular – look. 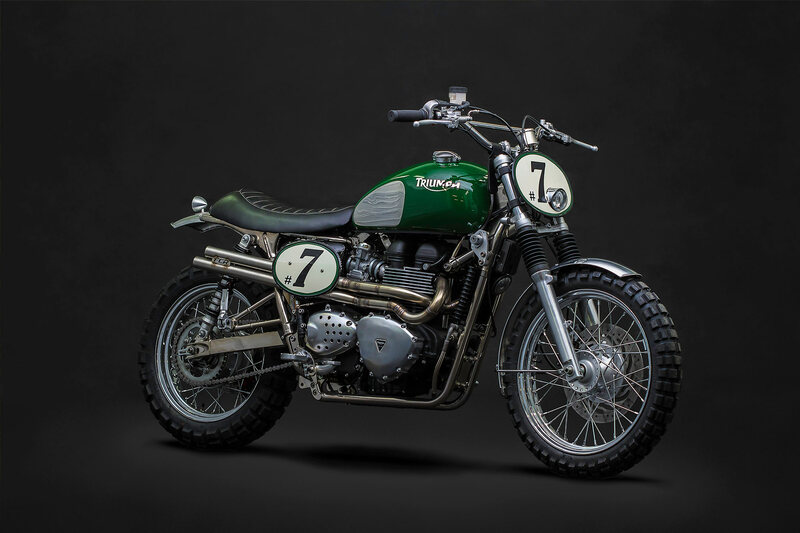 Scrambling ‘bars, replete with their classic cross member, were sat against stamped number boards, turn signals and new mud guards, all handmade by the FCR team themselves. As FCR pride themselves on the details, each item, each piece and each component was looked at for relevance, functionality and looks. 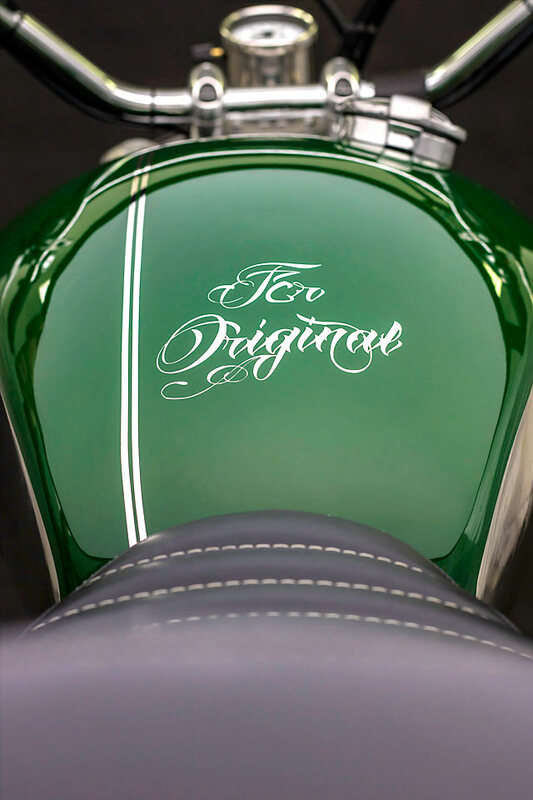 This is shown when studying the bike’s beautifully clean and minimal tail section. Why leave cut frame tubes unused when they can house bespoke rear indicators? Why indeed. The one aspect that was varied ever so slightly from the original was the bike’s comfort level. 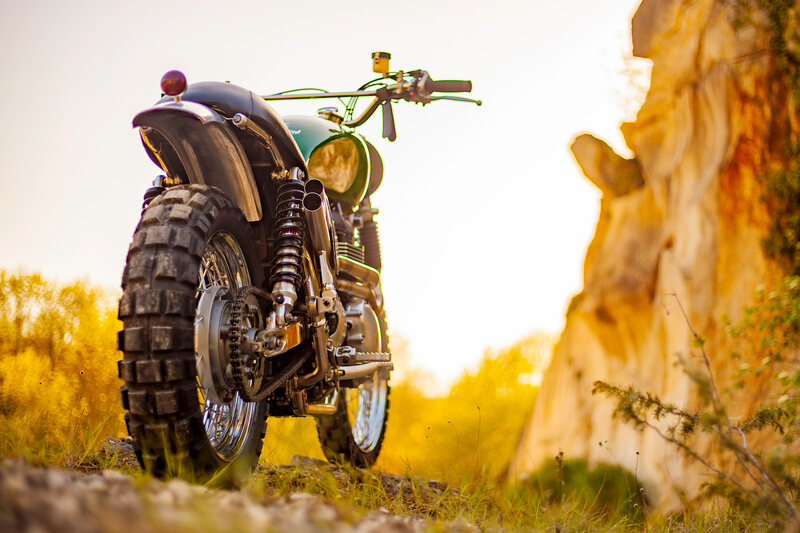 While authenticity was still top of mind for the team, the fact that the scrambler wasn’t solely to be ridden in desert races was an important consideration. 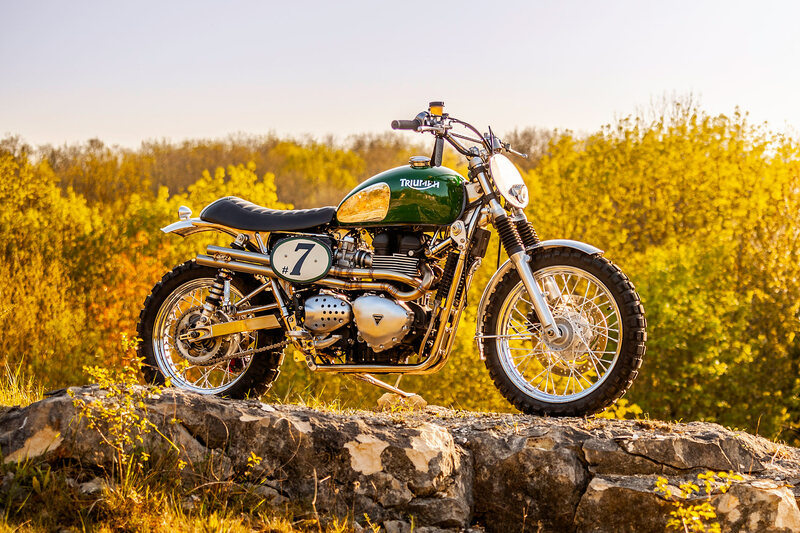 So a comfy seat, tailored by the Proust Saddlery, and the tweaked suspension set-up were both created with the bitumen and the dirt in mind. 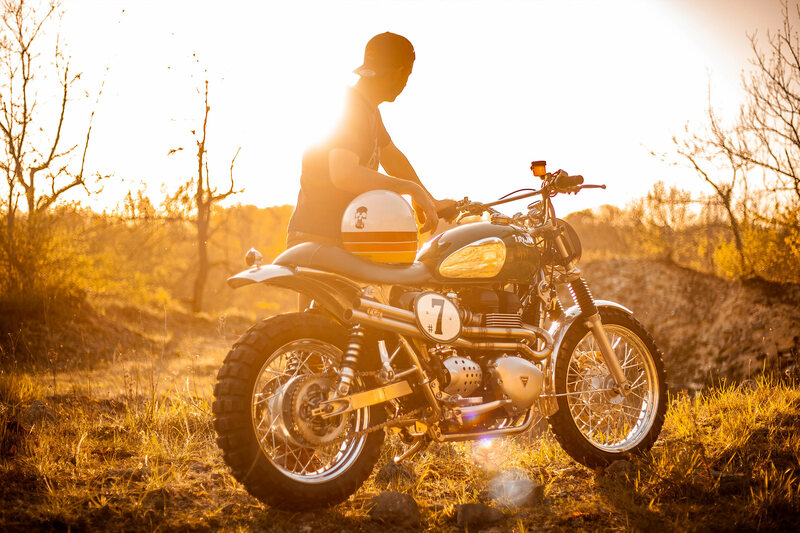 What’s clear about the scrambler from the very first viewing is just how much thought has been put into the exhaust’s shape and placement. 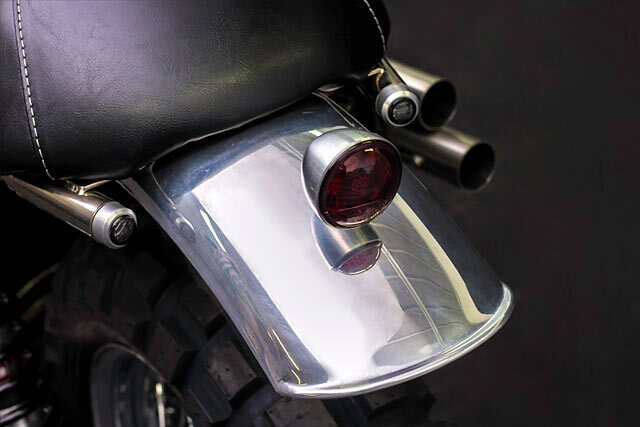 And that’s probably because – more than any other custom the shop has built – the pipes will make or break a bike like this. Many, many hours and sections of pipe were spent before it was ticking the team’s boxes. Likewise the bike’s paint wasn’t going to be a ‘one and done’ type of job. And the best part? Both were executed right there in the FCR workshop. No outsourcing here, folks.